Outbound customer contact is often confused with ‘cold calling’, an association that has proven toxic to a technology that has many useful implementations. Although diallers can be misused and they sometimes are, in the vast majority of cases they are deployed responsibly by organisations which would struggle to operate without them. Indeed, according to official industry figures, only 14% (!) of all dialler calls are for ‘cold calling’ or telemarketing purposes. 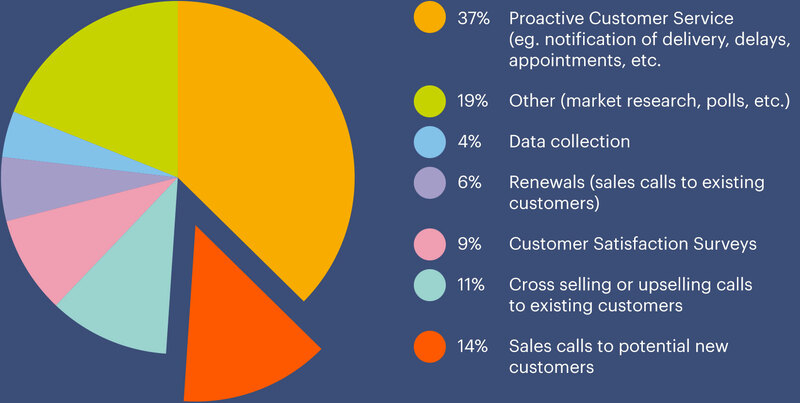 The largest segment of the outbound industry by far (37%) is Proactive Customer Service. These are calls made in order to provide customers with information, reminders, notifications or a range of other services. All this does not change the fact that diallers and predictive diallers in particular have been associated with the shoddy practices of rogue telemarketers who have abused the technology over the years and caused a major backlash against an entire legitimate industry which employs many thousands of hard working people. As a result, regulatory bodies around the world, such as the TCPA in the US and Ofcom & ICO in the UK, have been issuing ever tightening rules limiting the use of diallers in general and practices of Answer Machine Detection (AMD) in particular. At Noetica, we believe that the solution is not to prohibit the use of diallers but to improve the technology with creative innovation in order to facilitate the good, responsible use of predictive diallers, without losing any of the benefits that they can offer. Although the Noetica dialler had always provided a self-pacing predictive algorithm minimising the risk of regulatory breaches, we felt that this was no longer enough. A technology borrowing concepts from the inbound world in order to deliver predictive dialling with virtually zero dropped (abandoned) calls. In view of the recent tightening of the UK regulatory regime, Noetica has developed a unique technology for ‘safe’ Answer Machine Detection, eradicating silent ‘false positive’ calls. Patented Live Person Detection for zero ‘false positives’ and 40% performance uplift. Armed with SmartBound™ technology straight out of the box, anyone can use the Synthesys™ predictive dialler with confidence knowing that they will not be in breach of any legal constraints wherever the dialler may be deployed around the world. At Noetica, we wish to become the champions of responsible and considerate outbound dialling, whatever its purpose.